A swarm of strong temblors is rattling the seabed around Santa Cruz Islands and Vanuatu in the South Pacific. According to U.S Geological Survey, at least four earthquakes that measured greater than 5.0 magnitude were recorded by 5 p.m. Hawaii time. Following a 6.7 magnitude quake earlier in the day off the Philippines, four separate episodes were recorded – 7.8, 7.7, 7.3 and 6.9. The latest was the 6.9 off Santa Cruz Islands about four hours after the initial temblor that occurred shortly after noon Hawaii time. Although officials had warned of a possible tsunami threat to Hawaii, all advisories and alerts were cancelled by 2:30 p.m. The Pacific Tsunami Warning Center has canceled the tsunami watch that was issued for Hawaii after the earthquake off the South Pacific island nation of Vanuatu. The watch, issued at 1:36 p.m., was canceled after 2 p.m. Had tsunami waves been generated, the estimated earliest arrival on Hawaii shores would have been 6:50 p.m. The Pacific Tsunami Warning Centre has issued a tsunami warning for Papua New Guinea and island nations in the south-west Pacific, including Fiji, after a 8.1-magnitude earthquake struck off Vanuatu this morning. The epicentre of the quake was located 373 kilometres from Vanuatu at a depth of 33 kilometres, the US Geological Survey says. Vanuatu is 2,995 miles southwest of Hawaii. Earlier this morning a magnitude-6.7 quake struck south-east of the Sulu archipelago of the Philippines. The quake was in the Celebes Sea, 320 kilometres south of Zamboanga in Mindanao, and occurred at 5:41am (local time). The depth was 582.8 kilometres, the USGS said. NO TSUNAMI THREAT EXISTS FOR OTHER COASTAL AREAS ALTHOUGH SOME MAY EXPERIENCE SMALL SEA LEVEL CHANGES. FOR ALL AREAS COVERED BY THIS CENTER…THE TSUNAMI WARNING AND WATCH ARE CANCELLED. IS THIS A THREAT TO SAMOA PLEASE? A tsunami WATCH has been issued for Samoa. Updated info above. 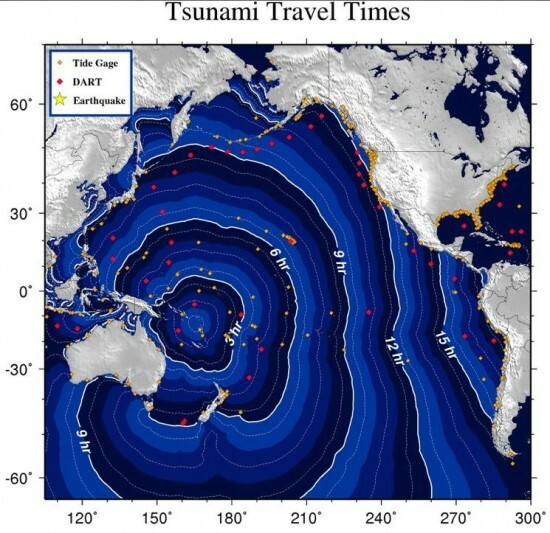 A tsunami WARNING for areas closer to the quakes.